As summer fast approaches, many blind organizations are hosting their annual conventions across the country. The National Federation of the Blind (NFB) has selected Orlando, Florida for this year’s gathering. From Tuesday, July 3 to Sunday, July 8, 2018 you can immerse yourself in the NFB community, enjoy opportunities to connect on important issues and experience a multitude of new technology and products. 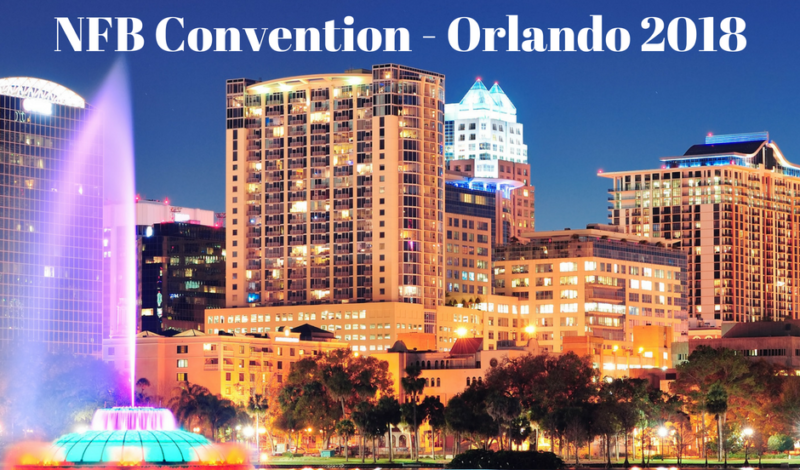 The convention takes place at Rosen Shingle Creek Resort 9939 Universal Boulevard Orlando, Florida 32819-9357. It’s not too late to make your arrangements! Read this post to learn all you need to know about NFB Orlando 2018! Preregistration is now open. When purchased online by May 31, the preregistration fee for the convention is $25 ($30 on-site) and the cost of a banquet ticket is $65 ($70 on-site). Preregister online now or use the mail-in, fillable PDF form. The 2018 room rates are singles and doubles, $88; and triples and quads, $93. In addition to the room rates, there will be a tax, which at present is 12.5 percent. No charge will be made for children under seventeen in the room with parents as long as no extra bed is requested. Please note that the hotel is a no-smoking facility. For 2018 convention room reservations you can call the hotel at (866) 996-6338 after January 1. You may also write directly to the Rosen Shingle Creek, 9939 Universal Boulevard, Orlando, Florida 32819-9357. The hotel will want a deposit of $100 for each room and will want a credit card number or a personal check. If you use a credit card, the deposit will be charged against your card immediately, just as would be the case with a $100 check. If a reservation is canceled before Friday, June 1, 2018, half of the deposit will be returned. Otherwise, refunds will not be made. All Rosen Shingle Creek guestrooms feature amenities that include plush Creek Sleeper beds, 40″ flat screen TVs, complimentary high-speed internet capabilities, in-room safes, coffee makers, mini-fridges, and hair dryers. Guests can enjoy four outdoor swimming pools, a full-service spa, and fifteen dining/lounging options from fine-dining and elaborate buffets to casual dining both indoors and poolside. The National Federation of the Blind of Florida, Iowa, and Virginia are hosting the 2018 National Convention. ID: A palm tree lined road in Orlando, Florida. White circle with NFB logo. Blind Motherhood logo below. Need an easy, inexpensive way to get from the airport to the hotel and back again? Consider using a Mears Motor Shuttle. Mears is offering a discount of $4 off the roundtrip price with the NFB Mears Shuttle coupon. Follow the instructions on the coupon to reserve your shuttle in advance or simply present the coupon at any of the four Mears Motor Shuttle ticket counters located on level 1 of the Orlando International Airport terminal. Call 800-759-5219 with questions. Click HERE to view a beginner’s guide to the NFB National Convention, intended to give the first-time convention attendee some important information about national conventions of the National Federation of the Blind (NFB). Need childcare during the convention? NFB Camp will again be available during convention sessions for children from six weeks to twelve years. Child care is staffed by qualified, experienced teachers. Details and registration can be found at NFB Camp Registration Form. The National Federation of the Blind National Convention offers a variety of promotional opportunities for organizations that want to show support for the blind. Participating in the convention will provide an ideal platform to showcase your products and services, whether you are looking for an increase in brand awareness, leadership positioning, new business development, or a combination of these. This year, they have added new and exciting opportunities for Elite and Platinum sponsors. If you would like to learn more about sponsoring our 2018 National Convention or becoming an exhibitor, please visit https://nfb.org/sponsor-and-exhibitor-info. Additional information as to meetings, schedule, hotel, etc., may be obtained as it becomes available by contacting the National Federation of the Blind at 200 East Wells Street at Jernigan Place, Baltimore, Maryland 21230, phone (410) 659-9314. Editor’s Note: Holly Bonner, Creator of Blind Motherhood, is a member of the New York City Chapter of NFB. Portions of this post were taken directly from the NFB’s Convention Home Page. Click HERE for more information.